You can add custom DNS records for a fully hosted domain as well as a domain set to DNS only. It all depends on what records you are creating and why you need them. Generally speaking, if you want your site hosted on DreamHost's servers, keep your site as Fully Hosted. However, if you want your site to point away from DreamHost by creating A or CNAME records, the first step is to remove the hosting service already applied to your domain at DreamHost. The following steps explain how to set a domain to DNS only (if necessary) and create the following types of custom DNS records. View the following article for instructions on how to set your domain to 'DNS Only'. 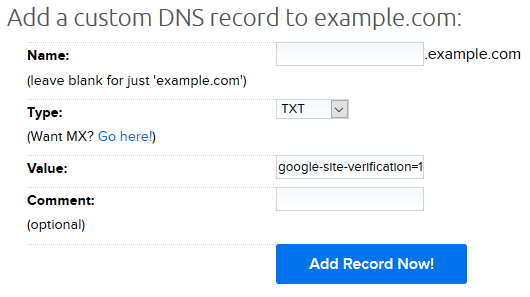 This is necessary if your site is currently hosted at DreamHost and you want to point your DNS to another hosting company using A or CNAME records. A records are IP addresses. They can be added to point your website to a different hosting company, or different subdomains of your site to external services. The following example shows how to point a subdomain of example.com to a specific IP address. For example, if your site is example.com and it's using DreamHost's nameservers, you could create a site called blog.example.com, or store.example.com. You can then set this subdomain to point to an outside hosting company. This is useful if you want a subdomain to point to an external host. The example below shows how to create a subdomain called subdomain.example.com and point that to an IP. Make sure to change the IP address to the IP the external hosting service gives you. Click the DNS link located under your domain on the Manage Domains page. Name: For the main domain, leave the ‘Name’ field blank. For ‘www’ or other subdomains, you can enter the subdomain name in this field. This field is often any of the following: www, blog, dev, store, and so on. Do not add the @ symbol into this field. This is added automatically. Type: The record ‘Type’ defaults to ‘A’. Value: Enter the IP address in the ‘Value’ field. This is the IP address you want this domain/subdomain to point to. Click the Add Record Now! button. The propagation for the new A record begins, and can take up to 6 hours before the new records update online. Along with custom A records, you can point your hosting away from DreamHost with a CNAME record. This record is created to point one domain to another as opposed to pointing one domain to an IP address like the custom A record. Please keep in mind that the root A record (for example, example.com) cannot be a CNAME record and must always be an A record. Click the DNS link under the domain name on the Manage Domains page. Name: This field can be anything. But very often it’s just www. Adding www points the www subdomain away from DreamHost. In the example above, the CNAME record is named 'calendar' and is pointing to 'ghs.google.com'. Type: In the drop-down menu select ‘CNAME’. Value: Enter the location you’d like this record to point to. CNAME records cannot start with an underscore. Click the Add Record Now! button to save. After clicking the Add Record Now! button, the propagation for the new record begins. This can take up to 6 hours before the new records update online. You already have a record for this name. You can't have a CNAME and any other record on the same name. This usually means that you're trying to add a CNAME for 'www', but since that record already exists in your DNS settings, you're not able to add a second one. If you need to add a CNAME for the www subdomain, you must set your domain to DNS Only first. If you're attempting to add a CNAME for something else, review your DNS records to see if the record you're adding already exists. For details on how to set up custom/vanity nameservers, please visit the following article. SRV (service) records are another set of records that can be applied to your domain. Certain programs and applications may require the set up of these types of records to make those services active. When entering an SRV record in your panel, ignore the TTL, class, and SRV fields. A full example is below. Below is an example of how to set up one of the records above. In your panel, go to Manage Domains. This is the 'Service' followed by the 'Protocol'. In the screenshot above, only one of the SRV record is being created. Repeat these steps for the second record. Type: Select SRV from the dropdown menu. After clicking the Add Record Now! button, the propagation for the new A record begins and can take up to 6 hours before the new records update online. _sipfederationtls._tcp	SRV	100 1 5061 sipfed.online.lync.com. _sip._tls	        SRV	100 1 443 sipdir.online.lync.com. A trailing period is applied to the end of the record once it is created. This will not cause any issues. View TXT record at Wikipedia. Navigate to the Manage Domains page. Click the 'DNS' link under the domain name. Name: This field can be anything. Very often it’s left blank. Type: In the drop-down menu select ‘TXT’. The example above is a typical Google site verification TXT record. DNS changes can take up to 6 hours to resolve. If your nameservers are pointing to DreamHost and the services set up for the record created are not active within this time, you may contact support for assistance at Contact’ Support. DreamHost support is able to point you to where you can create custom records as well as check to see if the record is properly applied to your domain. However, support cannot assist with setting up these custom records or whether the record created is correct or not. What DNS records do I point my site to? Article last updated April 09, 2019 19:28 PST.